Imagine a world where you engage with your officials, not wait in line at their building. Imagine when you complete one form digitally, that information pre-populates and kicks off other digital transactions in the future, minimizing your time to get whatever you are trying to accomplish: trash/water service, getting a passport. entering a world where our relationship with our cities becomes seamless and for the city, its costs to manage services are drastically reduced. In order to get there, cities need to work together and a research institution like Arizona State University can serve as the right partner to get started. I was on a great career trajectory at Honeywell and did enjoy the changes I could see in my growing operational roles. However, what I wasn’t seeing was my direct contribution to how I, or more specifically, my place in that company was changing the world. What I saw in ASU was a foray away from operational process optimization to comprehensive outcomes. It was clear that the main technology cloud providers are proving they can do better than most internal teams for computing workloads. With a new mental model in this innovative environment of ASU, I saw my role becoming more of a creative influencer directly tied to reimagining what is possible through software solutions. There is tremendous depth at ASU around smart cities and technical research. The university is quickly on a trajectory to be the largest research institution in the U.S. without a medical school. Think of the University not just as a large campus but a small city itself. We have it all to explore: buildings and facilities management; transportation challenges; diverse stakeholders like employees, students, non-affiliates and guests; entertainment venues for sports and cultural activities; and wellness facilities. Our delivering on the need to keep them all connected isn’t just innovative. It’s smart. To read the Smart Cities issue of TechConnect in its entirety, visit here. 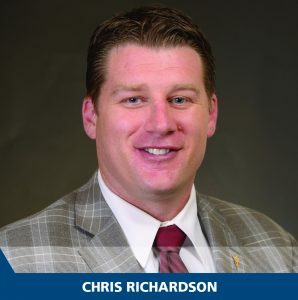 CHRIS RICHARDSON is deputy chief information officer – IT development, mobility, and smart cities at Arizona State University.